With proven lawn and landscape products, GreenTrust® Rewards and Acelepryn® Bonus, you can lock in a yearlong rebate, defer payment until June 28, 2019 and save on future purchases throughout the season. Early Order Period: October 1, 2018 to February 28, 2019. 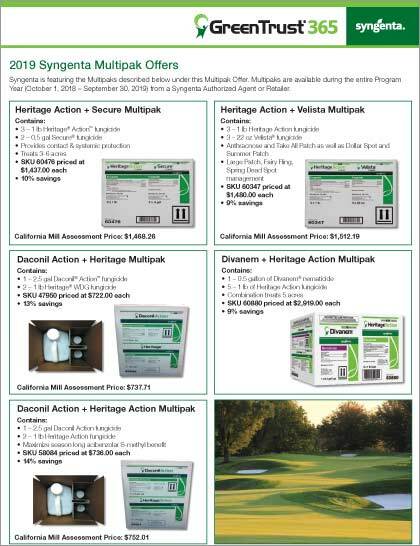 ©2018 Syngenta. . Important: Always read and follow label instructions. Some products may not be registered for sale or use in all states or counties and/or may have state specific use requirements. Please check with your local extension service to ensure registration and proper use. Acelepryn®, Barricade®, GreenTrust®, SummerPay™ and the Syngenta logo are trademarks of a Syngenta Group Company.